Mother’s Day in the United States is coming up on Sunday May 12. If you’re looking for a unique Mother’s Day gift idea, make Mom a video this year! Video offers an opportunity like no other to show Mom you care with a mix of old photographs, text, music, and even video clips. Take a trip down memory lane and tell your mom just how much you love and appreciate her. In this guide, we’ll take you through the steps for creating a video like the one above, using Animoto. 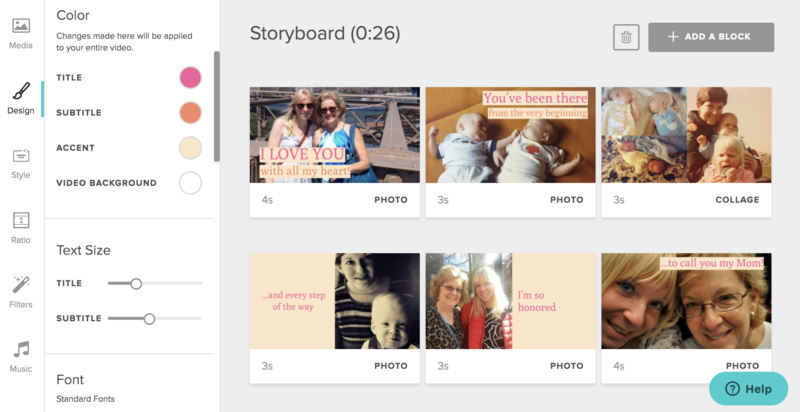 Make Mom a video, regardless of your experience, in minutes. 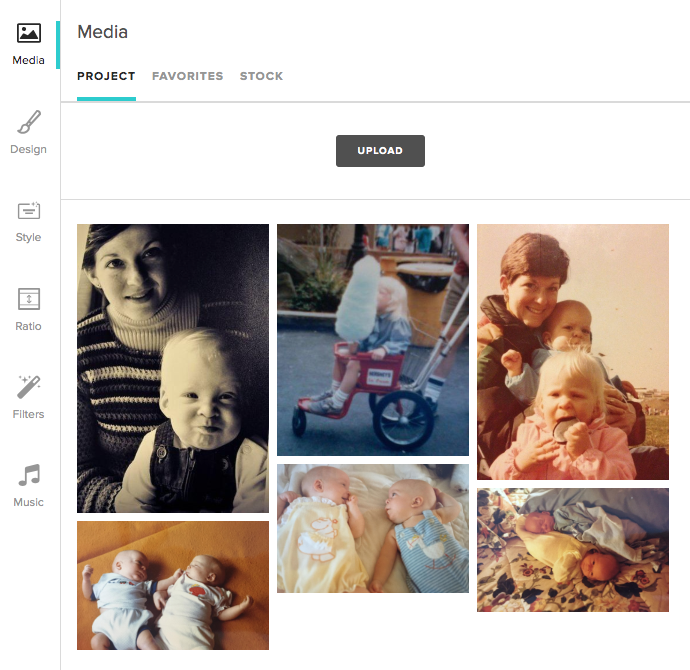 First things first, you’ll need to log into your Animoto account and start a new project. If you aren’t a customer yet you can sign up here. To get started, click here. You’ll have the option to select a template or start from scratch. A template is a pre-built video that you can customize by changing the text and adding your own photos and video clips. 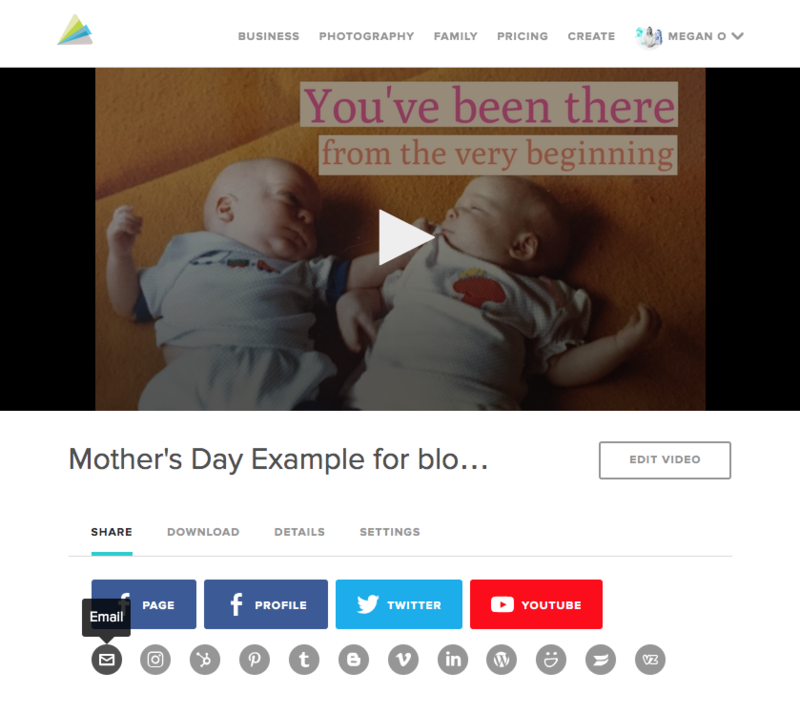 For a kick start with your Mother’s Day video you can take our birthday video template for a spin. But for the purposes of this guide, we’ll show you how to start from scratch. Click on the Start from Scratch button in the top right corner of the screen. Next, choose a style for your video. The video style you select determines how the text animates on in your video, as well as the transitions between your photos or video clips. If you’re not sure which style you like best, don’t worry. You can change the style at any point while you’re making your Mother’s Day video. During this stage, you’ll also choose the aspect ratio of your video. You can make a square video or a landscape one. 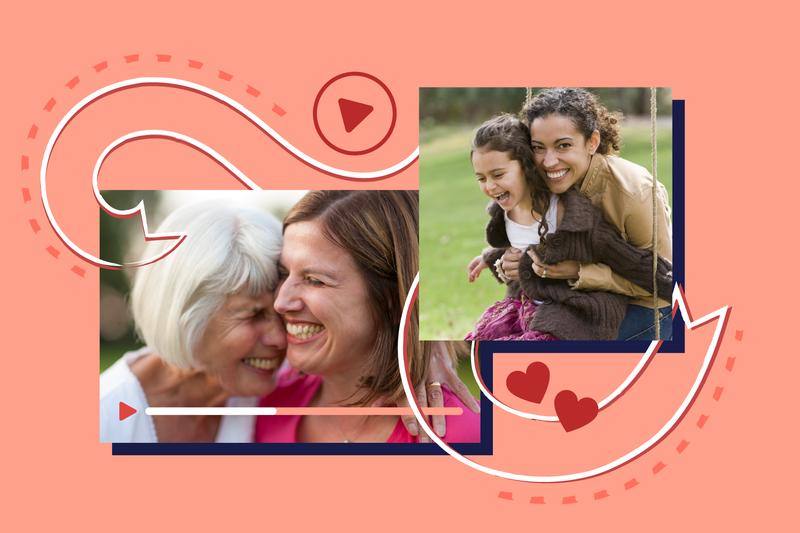 We recommend creating a square video if you plan to post it on your Mom’s Facebook page or share it with her on Instagram. Landscape works well if you’re sharing your video over email or plan to show it to her on a television screen. Now the fun begins! It’s time to upload photos to use in your video—and video clips too, if you’ve got ‘em. Take a trip down memory lane to find baby pictures that’ll tug on Mom’s heartstrings or other photos you know she’ll love. Not sure where to go for photos? Start with any photos you’ve got on your phone, computer, or social media accounts. But you can also include the photos you’ve got on the mantel or in old photo albums. Scan them or simply take a quick photo of the old photographs with your phone. That’s how I gathered photos for the example video in this post! Once you’ve uploaded your photos, it’s time to build your video. Simply drag and drop to move assets from the Media tray into your project. Clips or photos will display in the order they appear within your project. You can add text easily by hovering over a block and clicking on the text "T" icon. Share a message that’ll make your mom feel special. If you need a little inspiration, check out our collection of 20 silly and sweet quotes for Mother’s Day. Once your photos are arranged and you’ve added your text message, it’s time to dress up your video with colors and your favorite font. In the “Design” tab of your toolbar you can update the colors for your entire project and select a font. You can also change the color on an individual block by hovering over the block and clicking "EDIT." Last but not least, choose a song to play in the background of your video. Click on “Music” in the toolbar to open up our music library. Check out our top 7 songs for Mother’s Day, or browse our music library to find a song you think your mom will love. Once that’s done, just click Preview and Produce and you’re ready to share your video with Mom! Ready to share? We’ll quickly explain how to share your video in three different ways—by email, on social media, or on a DVD or USB. Sharing an Animoto video via email is easy. Head over to the video’s play page and click on the email icon. A window will pop up where you can fill in your Mom’s email address, plus add an optional personal message that’ll get sent along with your video. You can opt to send your video now, or if you’re preparing for Mother’s Day early you can schedule to have it delivered on May 12. If you’re friends with your mom on Facebook or other social media sites, you can share the video with her there too. We recommend downloading the video, which you can also do on the play page, and then uploading it to the social profile. You can post it directly to your Mom’s profile, or share it on your own profile and tag your mom so all your friends can see it too. Last but not least, you can share your video with your Mom on a big screen. If you’ll be there in person, you can log into your Animoto account to show her the video yourself on a computer. Or, you can burn it to a DVD or put it on a USB drive to view on a television screen. If you’re interested in learning more, check out our blog post on burning your Animoto video to a DVD. And while we have your attention, did you know Mother's Day is a great opportunity to market your business with video too? Last year Americans spent over $23 billion on Mother's Day gifts. To learn more, check out our blog post on video marketing tips for Mother's Day. And whether you're making a video for your mom, or for your business, happy video making!